The fourth Advanced Extremely High Frequency (AEHF) protected communication satellite, built by Lockheed Martin for the U.S. Air Force, was successfully launched today at 12:15 a.m. from Cape Canaveral Air Force Station aboard a United Launch Alliance Atlas V 551 rocket. Lockheed Martin confirmed signal acquisition at 3:47 a.m. ET. The AEHF system provides global, survivable, highly secure and protected communications for strategic command and tactical warfighters operating on ground, sea and air platforms. The satellite will now move into a testing phase prior to hand over to the Air Force. With four satellites in orbit, the AEHF constellation completes a geostationary ring and will be able to deliver global coverage. AEHF also serves international partners including Canada, the Netherlands and the United Kingdom. Lockheed Martin is on contract with the Air Force to deliver the fifth and sixth satellites and upgraded the Mission Planning ground system. 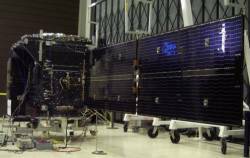 Lockheed Martin contributed payload system engineering, mission control ground software, solar arrays and the LM A2100 spacecraft bus, which is a dependable and low-risk platform for commercial, civil and military satellites. All AEHF satellites are assembled at the company’s Sunnyvale, Calif. facility. One AEHF satellite provides greater total capacity than the entire legacy five-satellite Milstar constellation. Individual data rates increase five-fold, permitting transmission of tactical military communications, such as real-time video, battlefield maps and targeting data. In addition, AEHF affords national leaders anti-jam, always-on connectivity during all levels of conflict.